After searching online for an answer to how to convert a toggle switch to a momentary switch I found the circuit below. I've simulated it and it works in CircuitLab. I'd like to do the same thing using a transistor instead of a relay but so far I haven't been able to make it work in CircuitLab. Can I convert a toggle switch to momentary switch using a transistor and capacitor? You will have to play around with the cap and resistor values in order to achieve your desired timing and intensity for the lamp. Note that the behaviour of these two circuits is not equivalent. The first circuit will be active on both transitions, while the second will be active on low to high, but not on high to low (or won't work at all without that diode). Not the answer you're looking for? Browse other questions tagged transistors capacitor switches relay or ask your own question. 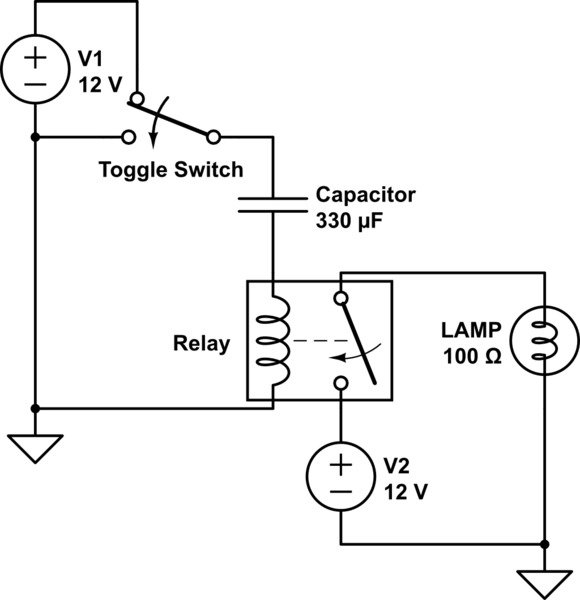 Mystery circuit: latching relay control with transitor / capacitor - why doesn't it work? Can a single power supply control multiple relays? How to fade or delay a DC Signal to remove speaker “thump”/“click”/“pop” from transistor switch? How to open and close PNP transistor with IO pin?